2013 was kind of a strange year. Professionally it wasn't the best. A fickle real estate market had me wondering what the heck was going on. But when I looked at last year's "Best of 2012" post and compared it to this one, I was amazed what progress my landscape photography has made. I've really come a long way in a short time. For the most part, I stayed closer to home this year. There was no grand 1,400 mile trip through four states like last year. I was happy to really explore areas I had only touched on in previous years going back and getting higher quality images. It also seems to me I was able to capture the landscapes in more dramatic ways. I made better choices as to when and where to go. The extra thought and planning really paid off. 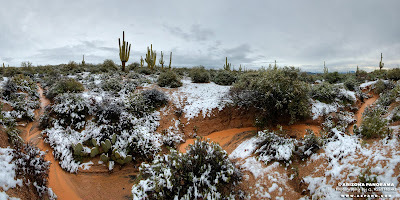 It was a cold winter day with mixed rain and snow when I shot this off the A-Cross Road near Roosevelt Lake. Salome Creek is a gorgeous tributary to the lake. 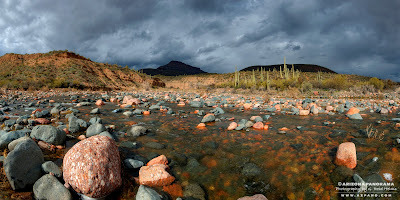 This impromptu stream was a result of melting snowfall in the desert near Four Peaks. Snow in the desert usually happens at least once a year in the foothills of the peaks east and north of Phoenix. This image was taken about the same time as the one above. 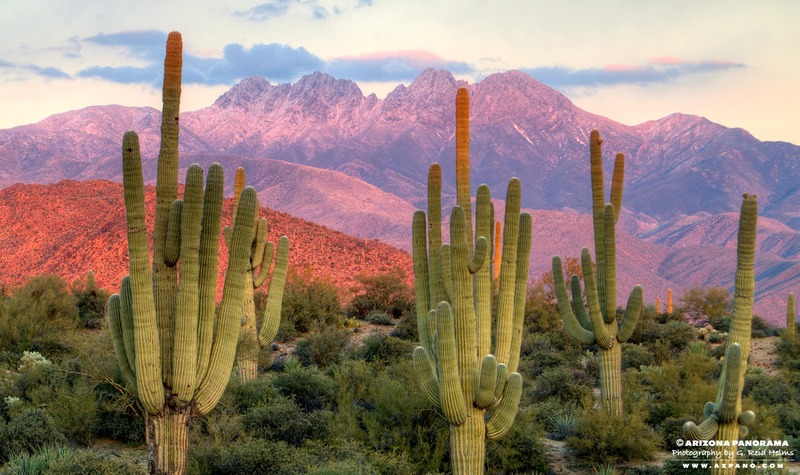 The setting sun's rays just kissed the tops of the saguaros as it lit up Four Peaks. Sublime. This canyon is second only in size to the Grand Canyon. Located south of Williams, I hadn't even heard of the place until shortly before I visited. 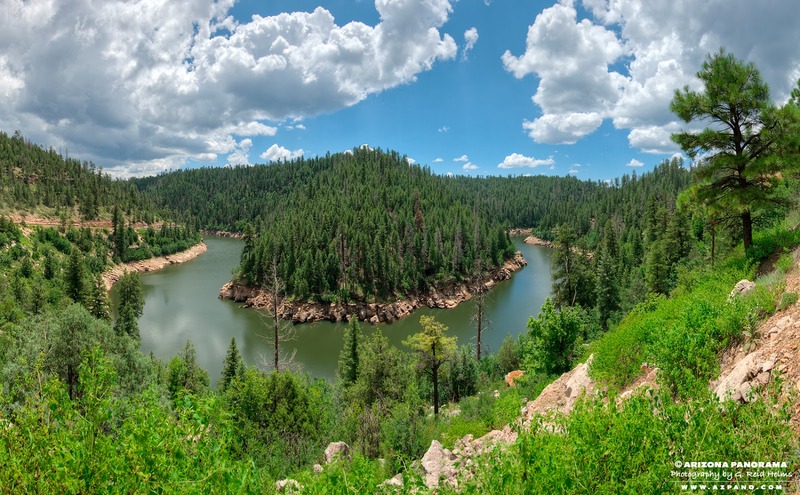 It's at the end of a long forest service road with a breathtaking view and totally worth the effort to find. The PanSTARRS comet was quite the event and a fun shoot. I wasn't sure if the city lights would make this a no-go, but it turned out just fine. 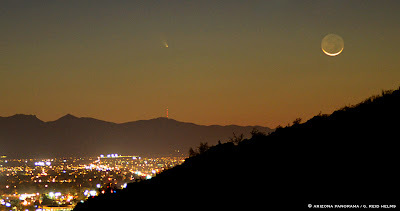 The moon's tiny crescent added a much needed element to the shot. This was an epic shoot and one of my favorites of the year. 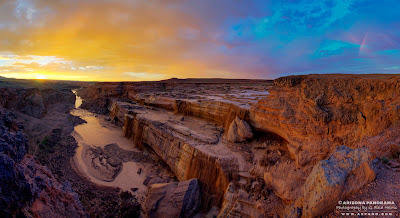 Located south of the Vermillion Cliffs in northern Arizona, this is a spot I've never seen any other photos of. I timed it just right with the full moon. A great sunrise was a huge bonus and made the trip extremely memorable. This was the shot I went to Marble Canyon for. I tried to shoot the rising moon, but it was too windy and the shots suffered. A high ISO and fast shutter speed made the shots too noisy. 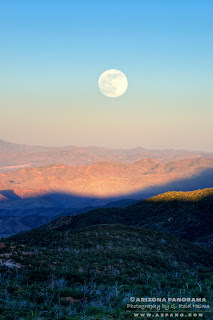 Clouds moved in and shut me down until 4:30 a.m. when the moon fell below the clouds and lit up the canyon. I couldn't have been more happy! The top of Humboldt Mountain provided the perfect vantage point for a rather disappointing display from the meteor shower. 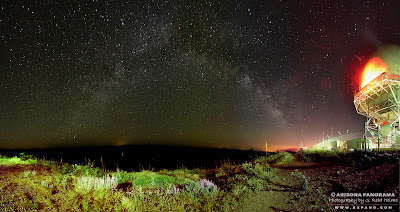 Still, the Milky Way was very cool and the FAA transponder tower added something other-worldly to this panorama. This was the second year in a row I shot the fireworks at Tempe Town Lake. 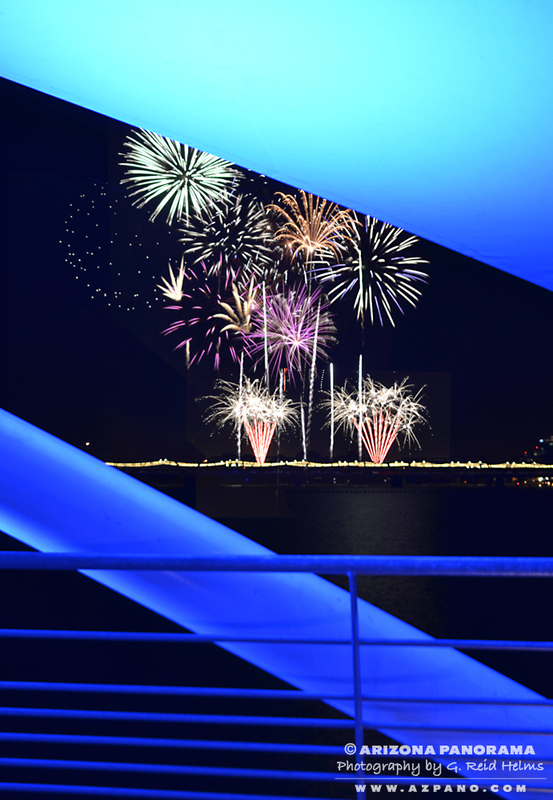 A pedestrian bridge over the lake provided an interesting foreground element. I made several visits to one of my favorite secret locations at Harding Point above the West Fork of Oak Creek. This night shot was a fun one. It was so dark out, I had no idea if my camera was doing its thing and I was getting the shot. Even though the falls weren't spilling at full strength, the light and conditions were ideal. I even managed to catch a small rainbow in this 180-degree pano. A day trip to the Mogollon Rim yielded a bunch of great captures. I stumbled on this creek when I took a chance on a forest service road leading back to the rim after shooting Blue Ridge Reservoir. I made a special point to get a good image of this amazing lake. The serpentine course of the lake was very appealing, but hard to photograph. Only one spot along the road provided an opportunity to capture it. 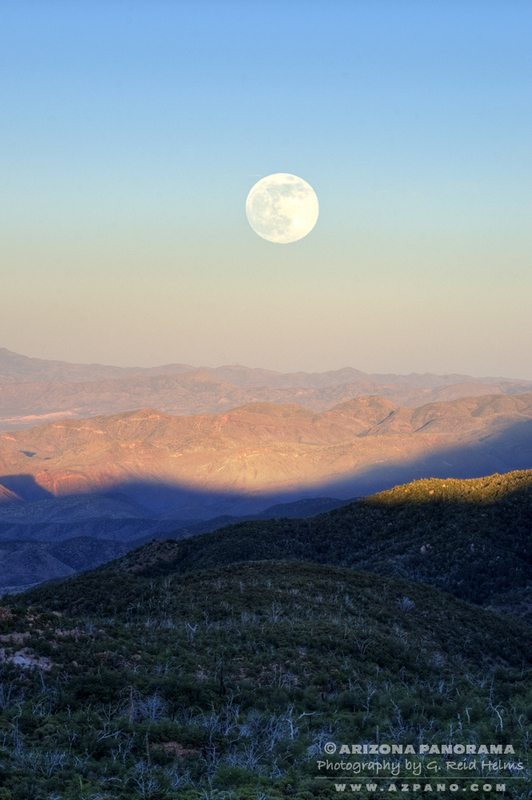 The top of Four Peaks was my destination for the Supermoon in July. A long look back into the valley was on the opposite side of the road I was photographing from. I was hopping back and forth between this view and the rising Supermoon and loving every minute of it. It had been ages since I had been to the south rim. The weather was a welcome relief from the 115 degree temperatures I'd left behind in Phoenix. At one point, I even got cold. 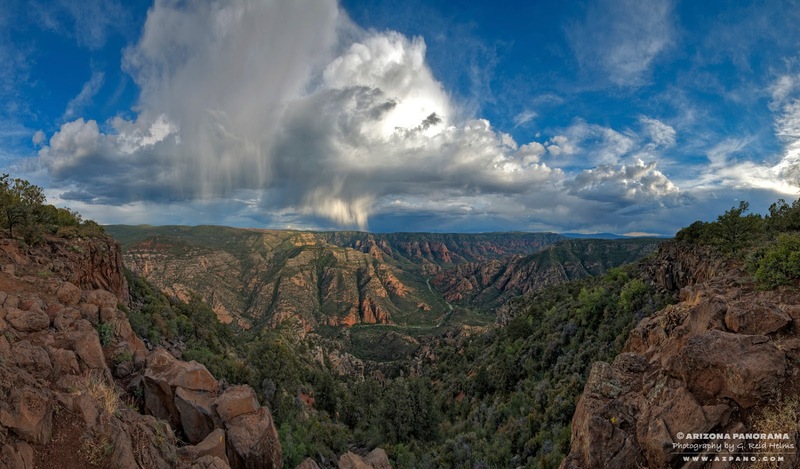 The monsoon conditions made the canyon a veritable paradise for my camera and I. 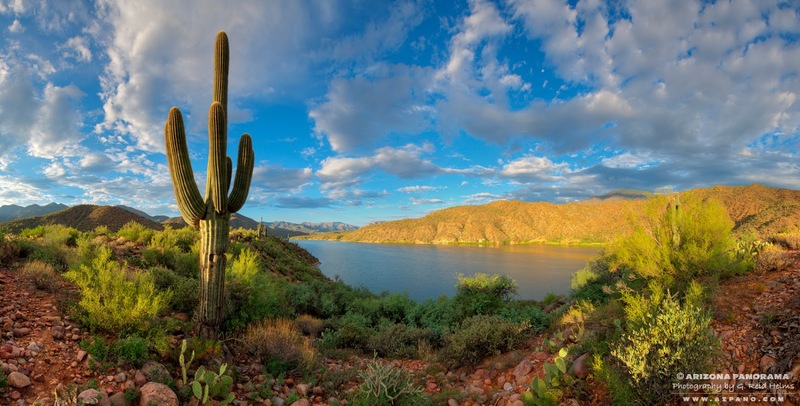 A quick overnight trip to the Apache Trail yielded several keepers. 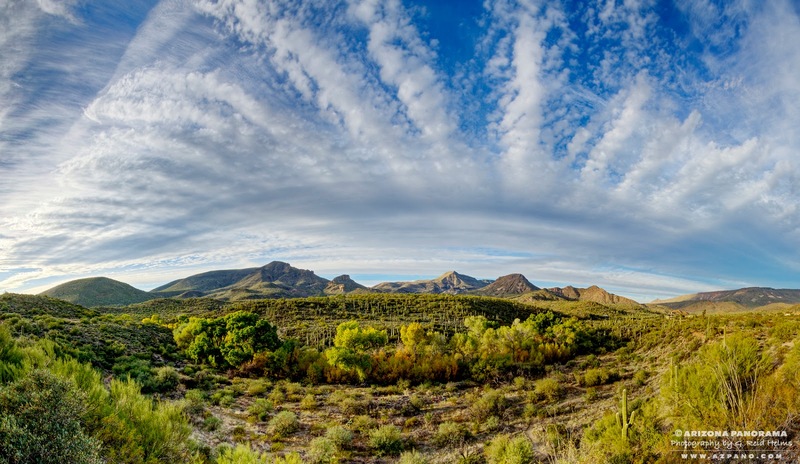 This is one of Arizona's most beautiful drives and yet again did not disappoint. 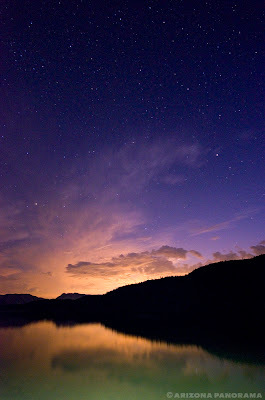 I took this single image at camp on Apache Lake the first night of my overnighter. I light-painted the water with a small handheld flashlight. It was the perfect addition to an already beautiful scene. ...from the second day of my trip along the Apache Trail. The lake narrows down as you get closer to Roosevelt Dam. I'd been through this area a couple years before and wondered what it would be like when the creeks were flowing. Fry and Kelly Creeks come together here to form Pumphouse Wash. The monsoon had dumped rain in the area most of the day before. It was absolutely beautiful and I shot my brains out for two days here. It was really hard to choose just a couple shots from this area. 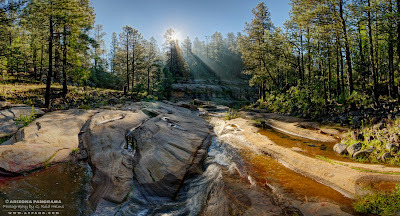 I just fell in love with the spot and the undulating Coconino sandstone rock the creeks flow through. 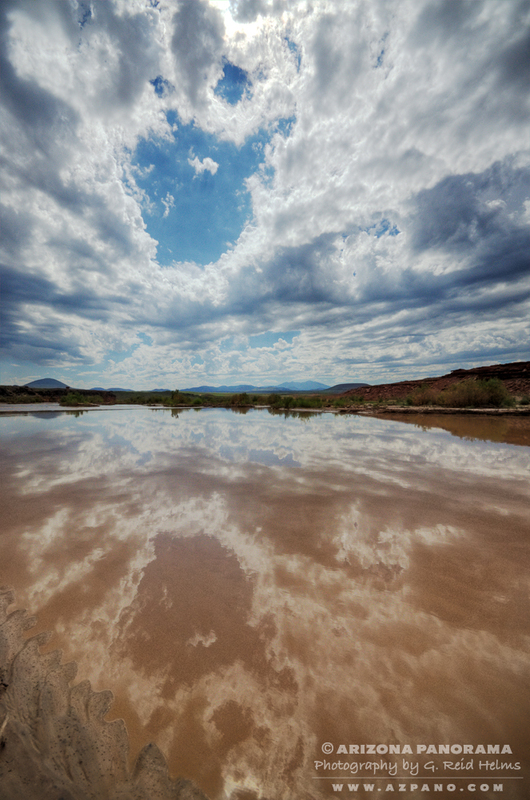 Okay, just one more from Pumphouse Wash. I swear, I shot every conceivable angle. The light and conditions were just that great. After having a blast shooting Pumphouse Creek the day before, I woke to some pretty special conditions. Just down the road from my campsite was a thick patch of fog from all the precipitation the day before. This is undoubtedly my favorite shot of the year. The fleeting nature of the conditions made it even more special. 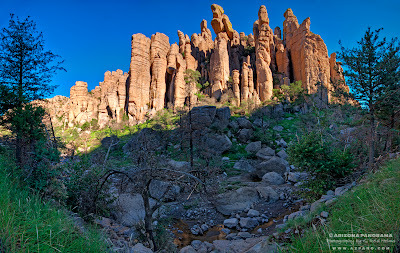 I made a extra effort to get to the Chiricahua's in southern Arizona this year. It had been on my bucket list for a while. An ancient volcano deposited ash that has eroded through the millennia to produce the rock pinnacles you see today. It was another great trip and lots of good photography. I even saw a very shy bear! After spending the afternoon at the monument, I camped on top Chircahua Mountain. This was the scene the next morning from my camp. It was a total surprise as I'd ventured up the mountain on a dark moonless night looking for a place to camp and had no idea where I was. It had been forever since I'd been to Montezuma Castle outside of Camp Verde in central Arizona. 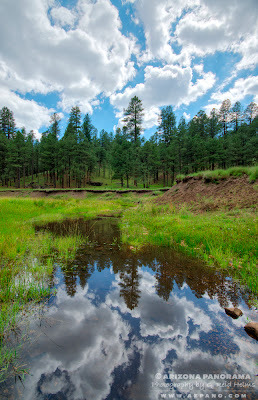 This vista of a big bend in Beaver Creek is just off the main highway and the road leading to the monument. The area around Needle Rock on the Verde River is another place close to home. I was totally shocked to happen on this herd of horses grazing in the river near Camp Creek. Better to be lucky than good sometimes. This spot on the Salt River is one I'd photographed several years ago and wanted to return to. 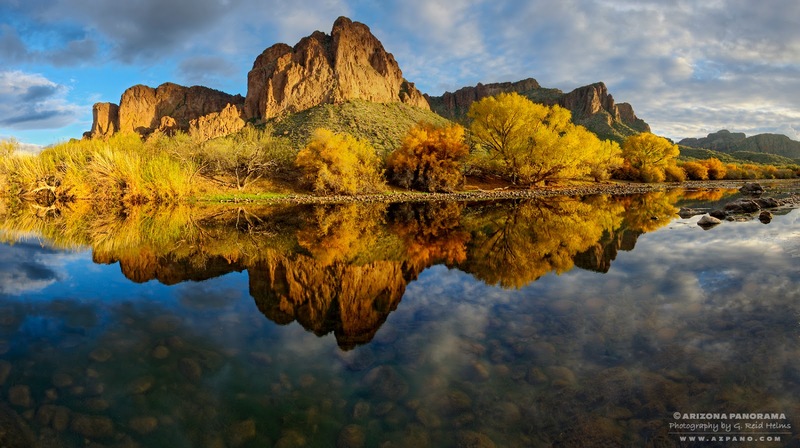 See it here: Salt River. A passing storm made the conditions ideal. When the sun popped out I gasped out loud it was so beautiful. Located just off the Bush Hwy, Water Users Park is the location where bus loads of happy inner-tubers put their butts in the water and float down the river on hot summer days. 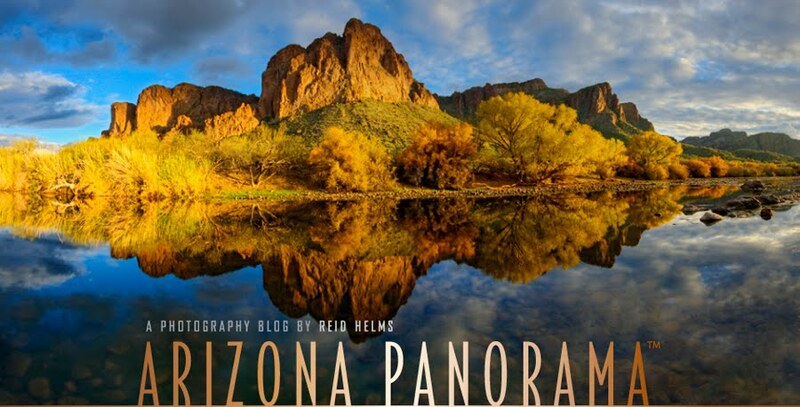 Even though I struggled professionally, it was the best year yet for my landscape photography. Looking back is always a good way to put it all in perspective and get me excited about the possibilities of the year to come. Many of these images can be purchased on my Fine Art American gallery. Follow this link for high-quality reproductions and framing options. Thanks for looking, I appreciate your patronage and Happy New Year!